Sit in comfort and watch the toxins as they release through your feet into the ion energy charged footbath. You will be amazed at what you see. The Aqua Chi Lymphatic Foot Bath stimulates detoxification and assists the body to balance its bio-energy fields. ​This relaxing and cleansing process assists in eliminating accumulated toxins from the body's free flowing lymphatic system through the 2,000 sweat glands in each foot. The Detox Foot Bath combines the life-giving properties of water with a specialized bio-electric charge, which enhances and amplifies the body's ability to heal, dramatically increase energy levels and help detoxify your body. The negative ions created during a session are similar to those found in hot springs and other naturally charged water sources known to be beneficial to the to the body. As a Detox and Health Center we find this to be an extremely beneficial therapy. It can also be used as an addition to compliment our other detox therapies. Sitting in a comfortable chair, you place your feet into the water that has a module in it. This draws toxins out through your feet. You are able to see the toxins release and watch the water change color right in front of your eyes. Sometimes by the time we have finished the water is black! We do this for 30 minutes. Then we rinse and dry your feet. When you are finished you and your feet feel fantastic. This service can be done alone or combined with a session in our foot massager to stimulates reflexology points and encourage increased lymphatic drainage. Detox Foot Spas operate through a process called electrolysis. This is done by generating the proper amount of current in the water causing the water molecules to divide producing negative ions. Once the negative ions are present in the water, the body absorbs these ions through osmosis. Based on Bioenergetics, it creates an ion energy field similar to that found in the human body. This stimulates cellular energy and enhances the body's ability to cleanse itself internally and naturally at an increased rate. The ionization process of the Detox foot spa pulls toxins out of your body through your elimination routes (colon, skin, breath, urine). Ions energize the body and neutralize a myriad of toxins. These neutralized microscopic particles then pass easily through the skin and tissue and are deposited in the water or sloughed naturally through sweat, bile and urine pathways. Most people are shocked at the different colors that the water will turn, even after just a few minutes of using the foot bath. The water changes color regardless of whether there is a person’s feet in it or not. This is due to the reaction of the copper array and the polarization of solids in the water. However, there will normally be 2-3 times more cellular debris in the water when combined with a person’s feet. The toxins in the body are re-ionized at the molecular level and react with the copper array. They produce colored debris in the water which can be black, green, brown, yellow, white or blue. 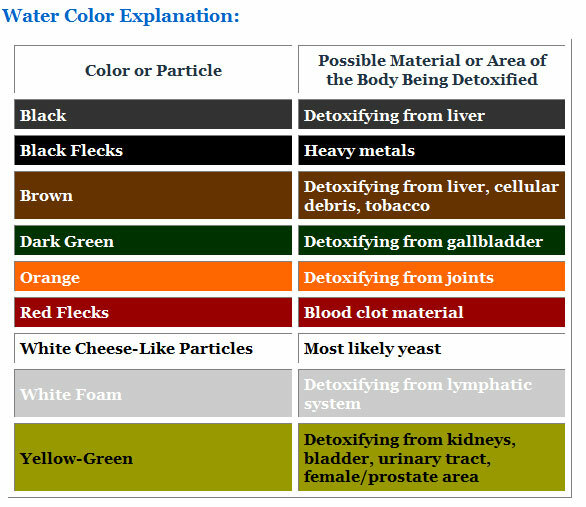 The color and amount of debris will depend on the person’s energy state and toxicity levels before each treatment. Water analysis documentation from several treatments has shown a dramatic increase in metals in the water after a treatment. Clients with pain, edema, gout, headaches, and swollen joints have often reported immediate relief. Other clients with arthritis, allergies, lymph edema, neuralgia and other symptoms have experienced relief and benefits with multiple treatments. Why Schedule a Detox Foot Bath Treatment? Ion cleanse detoxification accelerates change in the body. Environmental toxins, heavy metals in water we drink and food we eat, even the air we breathe can overwhelm our own body systems. Because of poor diet and high stress, we tend to accumulate and store excessive quantities of waste by products. This can really throw off the natural balance of our bodies. Detoxifying our bodies on a regular basis through the use of a detox foot spa is an excellent way for us to step into better health. The ongoing periodic detoxification is essential to maintain health and avoid disease. Being able to detoxify your body on a regular basis is a huge step towards enjoying a balanced and healthy life.